Alocasia zebrina is an Alocasia which is superb as an exotic house plant and is also one of Araflora'S prized additions of the past year. The Alocasia has two striking black-and-white leaf stalks which resemble the patterns of a zebra. It has a small dark-green arrow-shaped leaf. Alocasia zebrina is orignally found in the southeast of Asia. 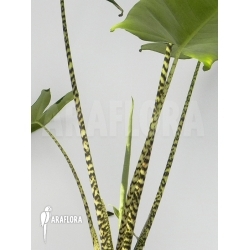 This Alocasia zebrina can grow very tall; up to 1 meter high. It is therefore a good investment. 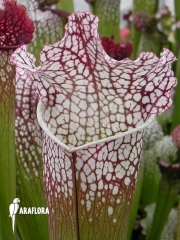 Among the Alocasia family it belongs to the Aroid species. Alocasia zebrina is a terrarium plant of exotic indoor plant. Ideal temperatures are between 20 and 30 degrees Celsius. Lower temperatures can be sustained, but the growth will be more compact. This zebra plant Alocasia zebrina likes moist soil and high humidity. We advise: water well, spray regularly, place in normal potting soil and give it some liquid plant nutrition from time to time. The symbols below also provide additional information on caring for the Alocasia zebrina.